Regression-based algorithms have shown to be good at denoising Monte Carlo (MC) renderings by leveraging its inexpensive by-products (e.g., feature buffers). However, when using higher-order models to handle complex cases, these techniques often overfit to noise in the input. For this reason, supervised learning methods have been proposed that train on a large collection of reference examples, but they use explicit filters that limit their denoising ability. To address these problems, we propose a novel, supervised learning approach that allows the filtering kernel to be more complex and general by leveraging a deep convolutional neural network (CNN) architecture. In one embodiment of our framework, the CNN directly predicts the final denoised pixel value as a highly non-linear combination of the input features. In a second approach, we introduce a novel, kernel-prediction network which uses the CNN to estimate the local weighting kernels used to compute each denoised pixel from its neighbors. 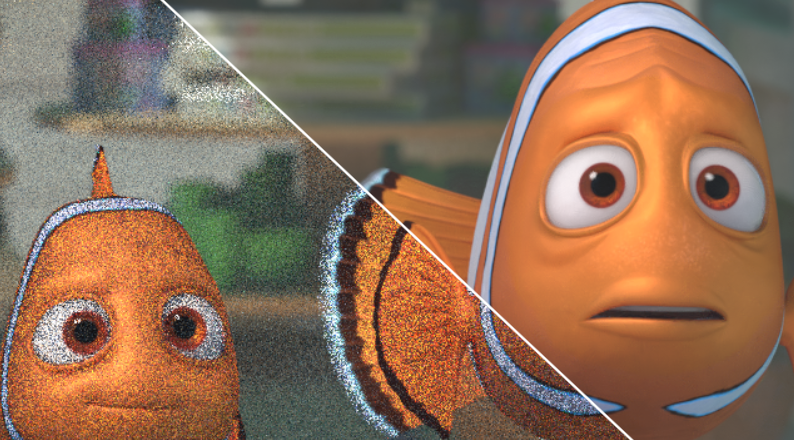 We train and evaluate our networks on production data and observe improvements over state-of-the-art MC denoisers, showing that our methods generalize well to a variety of scenes. We conclude by analyzing various components of our architecture and identify areas of further research in deep learning for MC denoising.